Alexandria Skunk Control and Skunk Removal! Alexandria Skunk Removal is a common call most wildlife control operators receive during the late winter and very early spring times of the year. Skunks often referred to as pole cats are for the most part is black to brown with a white to cream stripes running down the backside of its entire body from its nose tip to the tip of its tail. They are essentially the very same size of a house cat and are very shy in nature. Most people are familiar with the way a skunk looks from the very famous cartoon character Pepe Le Pew’. Skunks will often dig holes underneath the front steps of a home or building. Skunks will also dig burrows under decks or under outside sheds. Skunks are digging these holes in an effort to find a secure place to live and have babies. Skunk trapping will start their breeding process in late February and it will extend through the end of March often times you will know that this process is happening because of the amount of skunks seen ran over on the road this is a sure indication that skunks are in their breeding cycle. Female skunks will have their babies in approximately four weeks and raise their young throughout the spring, this process is totally unassisted by the male skunk. Skunks within the Alexandria area are often controlled by doing what’s called wildlife exclusion or by setting traps for skunks. Setting a trap for skunks is the most common way for a wildlife control technician to resolve a skunk problem. After the skunk has been caught the skunk holes which they have dug should be checked and filled in with concrete to assure that no other skunks in the area will use these open Dens. Call Alexandria Wildlife Pros to resolve your Skunk and wildlife problems at 703-881-3170. A common question received from homeowners is “How do I get rid of skunks?” The simplest answer is to trap them. Most people think that if you allow a skunk to stay under a house, porch, steps or building is that it will leave once it has its babies. This is not necessarily true. Skunks will stay and live in a single place for as long as they are allowed. You will never solve your skunk under the house problem by letting the animal stay where it is. You must start a trapping program in order for you to start the process of removing the skunks from under the house. This should be done by a professional company, such as Animal Control Solutions, to ensure all precautions are done to stop future critters from coming in. Once the skunk is removed, you then can have a skunk exclusion performed. This is a process in which a skunk is physically kept from entering a hole or crack that allows entrance under a house. If you have seen a skunk on your property, or if you are experiencing an unpleasant odor in your home or office building please give Alexandria Wildlife Pros a call and arrange the set up a complete skunk inspection today. 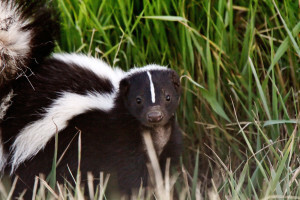 Skunks spray a strong musky scent, which comes from two glands near the base of the skunk’s tail, can hit a target 12 feet away. If threatened, skunks stamp their front feet, lift their tail, and growl. Skunks are excellent diggers that favor lawns, gardens and golf courses in search of food.